Just got back from Auburn because a big cross country event was there that A was in. He came in 7th of 75 kids--and this is his second week training and doing this sport. He looks very strong and solid as he runs...and between us, I think he is a natural. Bought two huge wooden baskets of roma tomatoes ($4 @) and am gearing up to do the cooking down and freezing thing. R. has been in the thrall of a book, The Omnivore's Dilemma, which details the ever present use of corn, and corn syrup thoughout our diets--something that is the demon. We try to eat simply--not processed--and our intent now is whenever possible, eat locally, buy from the farms things are grown--especially patronizing the amish here as it is totally low carbon--and about as organic as it gets. We are going to try to buy as much meat/poultry that we can get locally that is wild, or free range/grassfed as possible. This may change the mix on the plate, but so much the better for all of us. We will bend seasonally , as May-November here promises good things...but being eye to eye with another hubbard squash come February 28th is daunting. But, we will not buy asparagus and peaches that have been flown half way around the world to grace our tables during those dreary months. We are pretty much on track with this stuff--it just means tweaking the meat. And soda, we are stopping all soda except for those products with cane sugar (Jones for an instance)--as this is the biggest user of corn syrup and to be honest, where is it getting anyone? So, there is my puritanical rant. Had a great chat with Carol about Hartford yesterday. So much so, I woke up at 2 a.m. and solved the world's problems, and mapped out some strategies for her that I am anxious to put on paper. I am looking forward to Hartford, but am happy I didn't double up this summer. First, my business would have suffered and second--I might not have gotten the learning in such a full measure if it was so much. Now, I can revel in my little projects, and think about the next chapter with a little more space. Re: Memento Mori. The book is around 96 pps. I have come to an executive decision. I am going to finish the first book on my birthday, October 1. Seems somehow appropriate. I am going to fire it off to Lulu for one copy to check on the crossovers (its perfect bound), and how close they come with the trimming. If that is good, I am going to do an edition of somewhere between 35-50 (printing 25 now) and make it a limited edition. The limited edition of 50 is good as it squeeks me into the SOI show for the next year--as that is the minimum. I am going to output a lovely big cover on my epson...with a ribbon and have a few for the Ithaca Art Trail to sell, a few to sell from my blog and a few to use as self promotion to my clients and friends. This new progression with the floral images has been fun and probably will preoccupy me until the first. I am liking the black and white balance, the ability to crank up the volume either on the skull or on the flowers and obscure one with another...R. thinks there are tattoos and Georg Jensen style jewelry in the future. I am thinking skateboards and books. A gamely proposed if I designed a good tattoo, he might get one...That is enough to have me run for the hills. 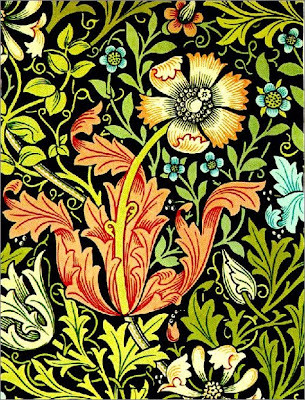 Have been looking at William Morris and Will Bradley's illustrations for insight and inspiration on how they handle the black and white thing. Need to get a little closer to this. Their balance of black and white, their energy of line and pattern is extrordinary. 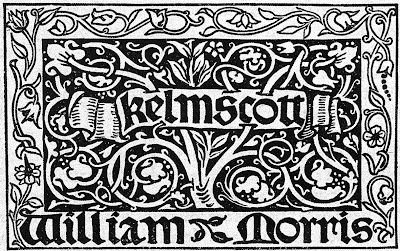 I feel there is something relative to the use of line and in the case of Morris, how he handles color and type that could serve as an inspiration on this Memento Mori project. Beautiful and warm here in Sheldrake. Low 80s. I am tired due to solving the world's problems but think a total submersion might do the trick--albeit it might be a bit brisk.